If you have a fire alarm emergency, we offer a 24/7 call-out service, 365 days a year – you don’t need to have a contract with us and we don’t need to have installed your fire alarm system. 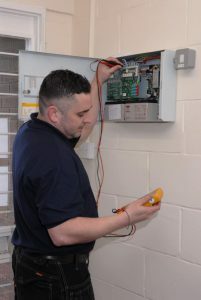 Our industry-approved engineers cover the whole of London and the South-East and work on all types of fire alarms, as well as emergency lighting. Our engineers are familiar with all of the main fire alarm models as well as many lesser-known brands. We can help with all of the following systems and more: Chubb, Honeywell, Gent, ADT, Haes, Kentec, Morley, Siemens, Tyco, C-Tec, Advanced, Twinflex, EDA, EMS. Whether your fire alarm system is conventional, addressable or wireless, we’re confident our engineers will be able to fix the problem. We aim to get someone to you within 2 hours, and no more than 4. We are confident that we can fix most faults within the time allowed in our initial call-out charge, but if the problem is bigger than usual, we will let you know as soon as possible so you can decide whether you want us to continue looking for the fault (for example, if we have stopped the fire alarm sounding, but haven’t isolated the source of the problem). Phone us on 0845 845 3001 or go to our contact form using the button below, to get an engineer out to you now.